Equipment used: StyleShoots Vertical. Click here to learn more. Leather handbags can pose a few tricky challenges to photograph professionally for your online store. 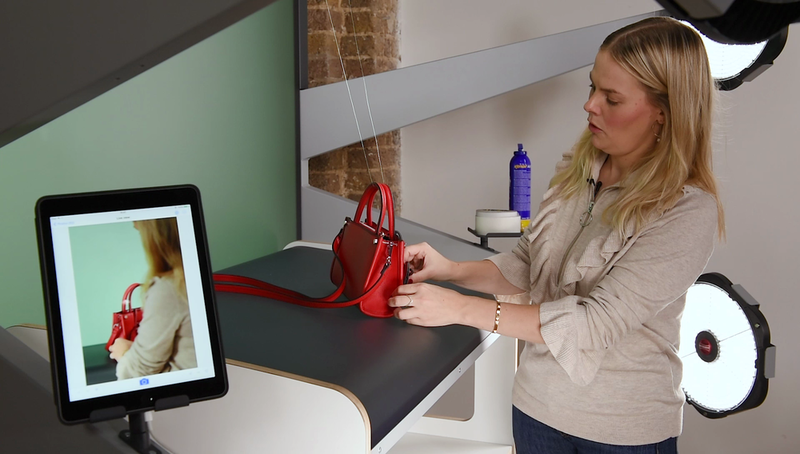 So in this fashion product photography tutorial, we will be showing you some tips and tricks on how to style a handbag - and give you an overview of the different shots you'll be needing. 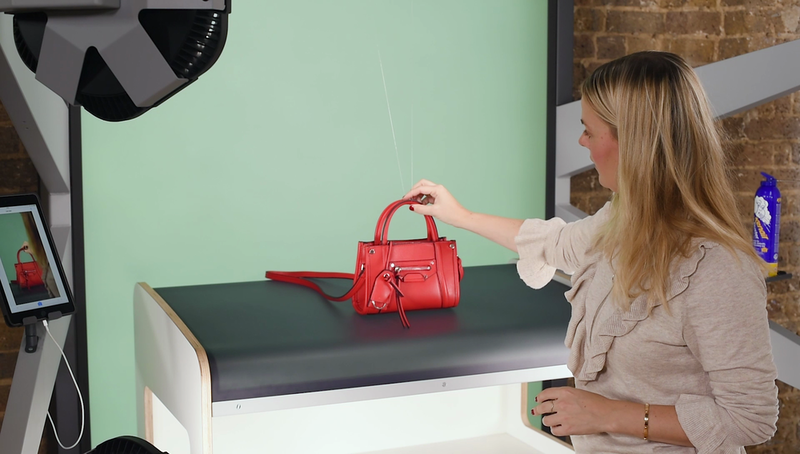 Tip: when photographing handbags from this angle, you need to keep it consistent across your whole website. To do so, mark where the corners of the bag are on your tabletop or use overlays to ensure the perspective remains the same. Give the bag a few sprays with some canned air to make sure the leather isn't marked or blemished with any unwanted dust particles. Handbags have lots of design elements that make them time consuming to style properly. Spend time delicately moving tassels, zips and tags to create an appealing look. You can use double sided tape to stick the tag to the leather as shown on the right. You can style and neatly place the long strap in front or behind the bag. In this example we're styling the strap behind. This is because there are a lot of features and details on this bag. Having the strap in front would be too 'busy' and detract attention from the hardware. It's important when taking shots from the front that the bag is not tilted sideways - or leaning forward or backward. In this example, we've chosen to show a small part of the strap around the side. Thanks for reading our tutorial on styling and photographing a leather handbag — part of our ongoing series of tutorials on product photography, styling and lighting. If you found it useful, why don’t you head on over to our Youtube channel and subscribe? Better yet, follow us on Instagram, Twitter and LinkedIn to get the latest updates. tips and tricks on product photography so you can drive conversion and sell more clothes online.